I sort of couldn’t believe there was only one other pattern called Antifreeze on Ravelry. I was inspired to call these socks Antifreeze because somehow penguins’ feet don’t freeze on all that ice, but you’ll need these socks to help you. I suffer from serious cold feet and spend my winters in two pairs of socks – thin cotton underneath and a thick wool pair on top. I’m not much of a sock knitter, so I wanted to design a pattern that I could return to again and again. I think it’s good to remember that if I like it and it works for me (or don’t like it and it doesn’t work for me) I am probably not alone in that, so I put the pattern in Penguin: a Knit Collection. They are basic top-down socks. The trickiest they get is making sure your cast-on is stretchy enough (so your foot can get in) and an afterthought heel (which isn’t tricky at all). You decide if you want to DPN or magic loop them. They’re comparatively quick to make and extra warm as they are knitted in Navia DK weight wool. Navia Sock and Trio are the same weight, but Sock contains a strengthening 20% nylon. I’ve used it for the areas that experience the most wear: heels and toes basically. Trio is used for the cuff and foot of the sock as it comes in a wider range of shades, including the pale pink and bright yellow of penguin feet. I got both from The Island Wool Company. 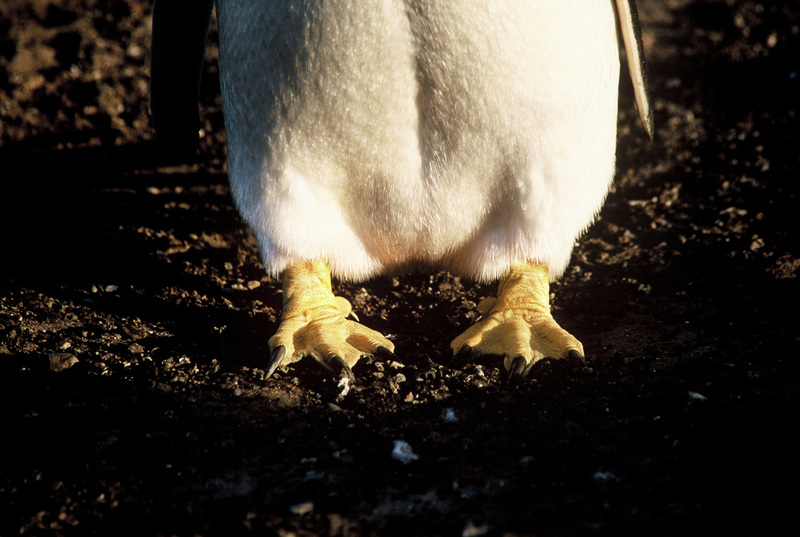 These fine penguin feet are photographed by Chuck Graham. He and Lori let me use some of their amazing photographs of penguins in my book, which really made it for me. They meant I could actually show my inspiration points, not just allude to them. As for the socks, they are thick and stripy, who could ask for more? To avoid stripes that jog, a vertical ‘seam’ runs down the fully ribbed leg – something I worked out when designing the Humboldt sweater. The first pair I knitted didn’t have the seam down the back. I’d used the jogless stripes technique I picked up from tech-Knitter. If you use that technique, you could ditch the seam, though the seam is the whole fun of these socks. You could also pass up on the stripes altogether. The ribbed cuffs are there to help keep the socks in place by giving some more elasticity. The foot is worked in stocking stitch – you wouldn’t want ribbing under your foot. That would be tempting blisters like nobodies business. One of the reasons socks are knitted to a tighter tension (than say sweaters), is to avoid giving you blisters – your delicate footsies won’t be able to discern the individual stitches which might otherwise cause irritation. The pattern is given in 3 widths, with 3 suggested lengths, which you can mix as you wish. That first test knit pair I made went straight on to Adam’s feet. His feet are so wide as to almost be square. Trips to the shoe shop always end up leaving him in a sad disappointed mood because none of the cool ones fit him. I’d planned to keep that first set as a sample for a bit, but he was so absolutely thrilled and excited to have had a pair of socks made just for him, to fit his flappers, that I didn’t have the heart to make him wait. He uses them all the time now. They are his cosy socks. We had so much fun modelling these socks for the images in the book. I say we, but really I should probably say I (and the other women present – Elle with her camera and Ania making us look good) had so much fun, but Adam might have suffered just a little. This may have added just a teensy bit to the hilarity of the situation, not to mention when Giovanni (whose bedroom we were shooting in), walked in to find us in our smalls, legs entangled, on his bed. I think we succeeded in coming up with a way to shake up the usual sock pattern poses. And really, in honesty, no partners were harmed in the filming of this book – last night I heard Adam tell his parents about it in a who’d-have-thought-I’d-ever-be-a-sock-model kind of way with a distinct note of pride. In the introduction to the Antifreeze sock pattern in the book I talk a lot about my English grandmother who was technically neither English or my grandmother. She passed away this summer at a ripe old age, but sadly Alzheimer’s didn’t allow her to enjoy the last bit very much at all. She certainly forgot she used to knit all my winter socks for me, in fact, she forgot she had known how to knit at all. At the onset of her Alzheimer’s, I remember my mum reminding her how to knit each time they got together. The last time I saw her, she flat out refused to believe she knitted the socks I was wearing over a decade before and now heavily darned. It’s been a funny summer – 3 funerals and a cancer scare, balanced out by only one wedding and bookended by babies being born and now a book! 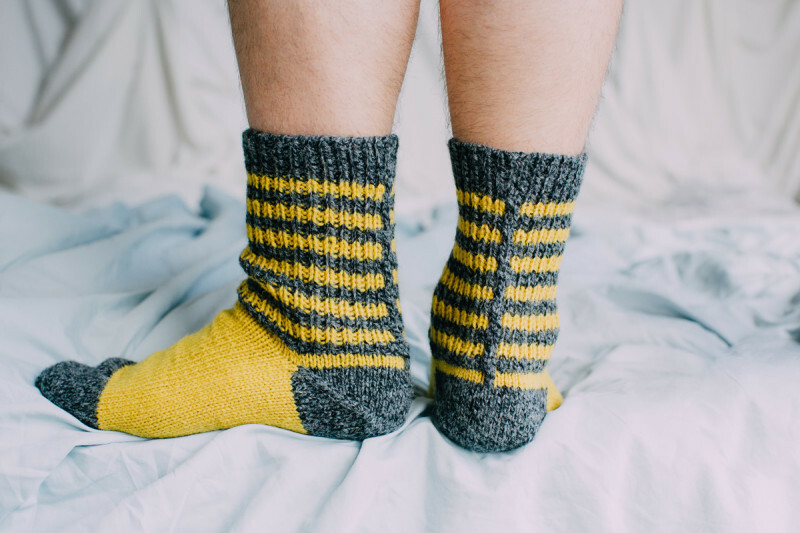 You can find the pattern details for the Antifreeze sock on Ravelry and GET your copy of PENGUIN: A Knit Collection HERE! or soon purchase it from your LYS (you might need to ask them to order it in, if they haven’t already arranged to stock it). Hi Dominique, Thanks for your kind words! Kate is amazing. I won’t be at EYF this year but hope to see you elsewhere soon. Happy knitting!